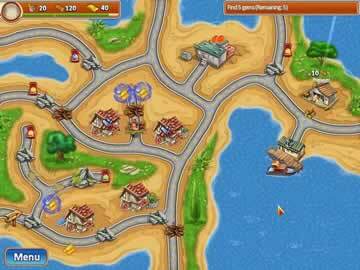 Rescue Team Game - Download and Play Free Version! Manage Your Time, Money, and Workers as You Come to the Rescue! A terrible storm has blown through the islands. Houses have been torn from their foundations. Debris blocks all of the major roads. Buildings are on fire, people are trapped, and hot dog stands have disappeared without a trace! Can anything be done? Is there no hope to be found? Enter the Rescue Team! These diligent workers are specially trained to handle crises like this! They’ll clean up these streets, get the buildings up to code, organize rescue efforts, and quench any and all fires. All they need is a talented team leader to keep them together, tell them what to do, and pay for their coffee and donuts. All they need…is you! Take heart, though, because storm cleanup is easier said than done. You have over 60 levels to complete, where you’ll have to accomplish any number of goals. Your goals include saving all the stranded people, fixing a minimum number of houses, repairing a certain building, or most important of all, collecting jewels. You can’t lead a successful rescue team without any jewels. But watch out, you’re going to have to overcome all the obstacles literally in your way. Collect and manage three resources: gold, lumber, and food. Time is ticking! Race against the clock, or sacrifice your bonus points. Clear debris from the roads so your workers can reach more areas of the map. Repair destroyed buildings, broken bridges and collapsed roads. 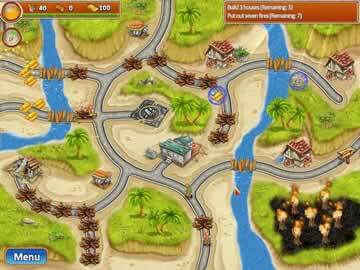 Use the helicopter to rescue stranded people and quench fires. Fortunately, you have ample strategies to make your job much easier. 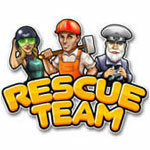 Rescue stranded workers to recruit them to the team. Receive a regular income of resources from the grateful people whose homes and businesses you restore. Grab power-ups! Increase the speed of your workers, get more gold, produce more food, and more! Use dynamite to blow up blockades even your own workers can’t get past. It’s not just the island that needs help. You have a personal stake in this mission yourself, with your own estate suffering grievous damages in the hurricane as well. The roof, the windows, the walls, and even your lawn and car all need to be repaired. Save up the money you accumulate during your rescue efforts, and you can rebuild your home back to its former glory! These islands aren’t going to save themselves. Another storm could be just around the corner. Put your Rescue Team together today, and come to the rescue!